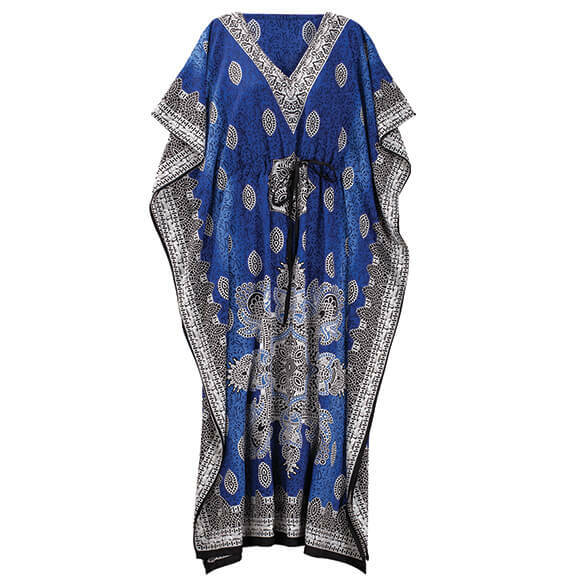 Whether relaxing at home or walking on the beach, you'll look as great as you feel in this flowing, flattering Blue Mosaic Drawstring Caftan. Offering the cool, breezy coverage you love, its bold mosaic print lends instant style, while a drawstring waist lets you wear it loose or cinched for a sleek, custom fit. With a light, airy fit that's never confining, it's your go-to look for versatile style that's both beautiful and comfortable. Exclusively designed by Sawyer Creek Studio™. Caftan dress features a flattering V-neck and fluid batwing sleeves. 54"L overall. One size fits most. 100% polyester; machine wash and dry. BEST ANSWER: Thank you for your question. This is one size fits most and we do not offer different sizes. We hope this information will be of help to you.